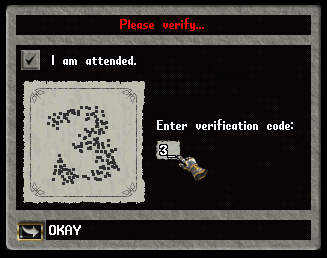 We will begin testing a captcha system to verify players are attending their resource gathering macros. The attendance check may appear during any type of resource gathering, and failure to respond correctly may result in your character being considered unattended (with jail time as per our Shard Rules). To verify you are attending your macro, simply check the "I am attended" checkbox and enter the verification code (which will be a number ranging from 0-9). The gump automatically closes after 2 minutes, so don't take too long! Lomita, The Llama Vortex, coveiro and 10 others like this. Very nice!!!! great work eos! Legacy and tank like this. What happens if someone puts the wrong number in with a script? He needs to gather 100k of wood/ore by hand to free himself. Mochizuki Shiryu and Eos like this. Mochizuki Shiryu, Yumiako and patla like this. Yumiako and Bad Religion like this. We will begin testing a captcha system to verify players are attending their resource gathering macros. Does this include AFK buying/selling to NPCs? Valkyrie, Vander Nars, Bad Religion and 2 others like this. I just realized that was their guild name lol. How ironic of a name.